Last Saturday at work was our annual day of staff inservices and team building activities. I last presented in 2014 about Spin Heart Rate & Training Zones so I was due for another presentation. 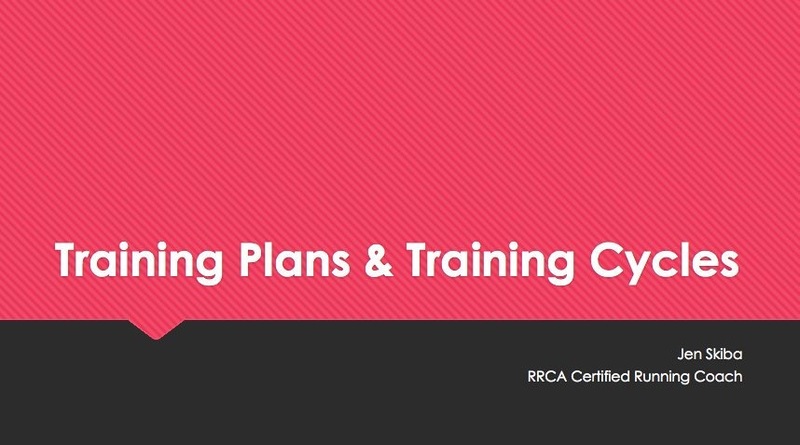 This past year I became a Certified Running Coach through the Road Runners Club of America (RRCA) so I got to talk about one of my favorite topics: Running! More specifically Training Plans & Training Cycles and special considerations for different types of clients. · Are you new to running? If no, is your running consistent on a weekly basis? · How many days per week are you currently running? · How many miles per week are you currently running? · Do you cross train? Strength train? · Have you ran any races in the past 2 years? Please list recent race results. · What are you running goals? · Are you currently signed up for any races? Do you have any goals specific to those races? · How many days per week do you plan to devote to running? · Are there any other time commitments or considerations I should know about? · How do you track your runs? GPS watch? Smartphone app? The above questions are only a portion of my new client questionnaire. You really have to get to know your client before you begin putting together a training plan. Find out what they are already doing, what are their goals and how are you going to help get them there. I always ask about time commitments. This is important to know. For example, you don’t want to make your client’s hardest week in training the week that they have to travel for work and are unsure of where and even if they will have a chance to run. It’s also important to know how your client tracks their runs. If they don’t have access to GPS but have a stopwatch, you can’t give them specific pacing workouts. Instead you may have to be a little bit more creative about workouts focusing more on time rather than distance and pace. 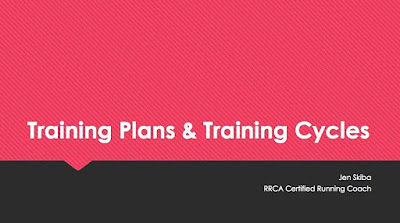 When developing a training plan for a client that is currently running, it’s a good idea to develop a plan where Week 1 is similar to their current activity levels. You want to be able to set them up for success. If running 4x per week works for their schedule, don’t try to push them to 5 or 6 days per week. If they have been running 3x per week but want to be running 5x per week, gradually get them there. Adding too much mileage too soon will increase any runner’s chance of injury. The first phase of any training plan should be Aerobic Base Building. Your clients should be running almost entirely at Conversation Pace. This may feel easy and they may be eager to push harder and run faster, but this is a critical part of training to build endurance. Next start to add in strength with hill workouts, Fartlek runs and possibly even introducing tempo runs. Then depending on the race distance and goals long intervals (800m-2000m) and short intervals (200m-600m) before taper and race day! A macrocycle is the entire training cycle leading up to and including a client’s goal race. This could also be an entire racing season. A macrocycle typically last 16-26 weeks with about 2-3 macrocycles per year. A mesocycle is a specific training phase for a specific purpose. They can be anywhere from 2-10 weeks in duration or about 4-5 mesocycles per macrocycle. A microcycle is a series of days that make up a brief clock of training. The most common training plan uses 7 days as a microcycle that breaks down the plan week by week. A really cool concept that I learned in my RRCA Certification Course is the IIP mesocycle. I can’t find much information on the Internet about it but I have been using this in my own training and with a lot of my clients—and not just running clients. According to the RRCA, IIP stands for Introduce, Improve, Perfect. The basic idea is a 3-week cycle of the same or similar stress. Week 1 you introduce the stress. Week 2 you practice and improve. Week 3 you perfect. You progressively overload the system, adapt to the workout, and then move on to a new IPP cycle with a new stress. I followed this theory in my own Houston Marathon training. From a weekly mileage or long run perspective, build for 3 weeks then back off for an easier, recovery week. Build for 3 weeks then back off and so on. · Who? : Beginners brand new to running or former athletes getting back into running. o Focus on the run/walk method. Gradually increase run intervals until they can run a 5k without walking. Some beginners may take longer than others. o Teach them Conversation Pace. o Start to build on the long run. Introduce strides, hills & Fartlekrunning. · Motivation: Beginners may rely on the coach for motivation while others may actually be too motivated. You often have to teach new runners to hold back and trust the process. Hello patience! · Discomfort vs. Injury: As a coach to a newbie runner, you must teach your athletes the difference between discomfort and injury. Know the warning signs of injuries and encourage injured runners to back off and see a healthcare professional. · Who? : Experience is not based on speed and ability but on mileage and years running. This is someone that runs 15-40 miles per week and is looking for a coach for guidance to improve times and technique. o Add weekly mileage and build on the long run. o Strength workouts: hills, Fartlek, tempo. o Long intervals (800m-mile repeats) and short intervals. o Gradual progressions to avoid injury. o An experienced runner may seek you out for help but still be unwilling to modify programs and try something new. You have to gain their trust throughout the process. o Runners need to learn to reach their physical potential. Racing hard will be uncomfortable. Have them practice being comfortable feeling uncomfortable! o Experienced runners may come to you in a rut. They may already be worn out or get worn out a few weeks into a new training plan. It’s the coaches job to recognize this and modify plans to allow recover before building back up again with mileage and workouts. · Who? : Runners training for a marathon averaging 20-40+ miles per week. o Develop the ability to run fast during long runs. o Threshold pace work, tempo runs at marathon goal pace, long run intervals. o Learn and practice the art of negative splits! SO IMPORTANT in marathon training! · Find balance: Marathon runners often have a hard time managing the ups and downs of training cycles. They may struggle finding balance with real life and the coach may need to help them by making training plans more manageable. It is also common for marathon runners to develop relationship troubles—all that time away from home, staying late after work to run, running early and for hours on a weekend morning, etc. o Your client may face an injury during training. This can make or break them not only physically but also mentally. The coach plays a big role to keep spirits high, modify goals, modify training plans, and help steer them in the right direction for medical care and treatment. There are endless possibilities when it comes to training plans. Everyone is different so what works for one client may not work for another. A good coach will develop a custom training plan that will help you find your true potential and guide you to faster running & PRs! Jen Skiba is a Certified Running Coach through the Road Runners Club of America (RRCA). Whether you are a beginner looking to get started running or at the intermediate level hoping to improve you times or tackle new distances, Jen can help you reach your goals! You can book sessions with Jen through CoachUp to get started today!